Rocky Mountain National Park receives millions of visitors each year, and for good reason. The park boasts some of the most scenic landscapes in the country, including views of Longs Peak and the Continental Divide. Rocky Mountain National Park has something for every visitor—whether you’re an urbanite looking for a restful getaway or an outdoor enthusiast ready to tackle the park’s many trails, lakes, and mountains. Of course, there are some experiences that everyone can appreciate, and that’s what you’ll find in this guide. We’ve owned Aspen Mountain Cabin—a charming, two-story log cabin only four miles from the Wild Basin Entrance to RMNP and about 15 miles from Estes Park—since 2005, and the Park has become like a second home to us. We’d like to share a little of our favorite things with you. Nestled 4.9 miles from the Wild Basin trailhead, Ouzel Lake is a well-known fishing destination on a uniquely scenic route. Start your day early and allow three to four hours of travel time to reach the lake, which sits at 10,000 feet with an elevation gain of roughly 1,500 feet. Take note of the scenery along the way; you’ll see the remains of the 1978 Ouzel Fire that started from lightning and burned more than 1,000 acres. Ouzel Lake is open for catch-and-release fishing and therefore no bait is allowed. All areas of the shore are easily accessible. It is home to a plentiful population of native Greenback Cutthroat Trout, making it a promising area to reel in a catch. Adjoining Ouzel Creek, located toward Ouzel Falls, provides another tempting location for the intermediate fisher. Visit http://www.nps.gov/romo/planyourvisit/fishing.htm to learn more. Spanning 8.34 miles of beautiful waters, wildlife, flowers, and forest, Thunder Lake Trail is known for its incredible views of nature. The trail features mostly moderate-to-difficult hiking through forest, creeks, rocks, logs, and hills. Note that the hike is difficult if you are carrying a lot of weight, but the extra few pounds to bring a camera are worth it! Horses and llama are suitable, but bikes and dogs are not allowed. The trail runs beside the St. Vrain River and offers breathtaking stops along the way, including Calypso Cascades and Ouzel Falls. Take a rest and enjoy the beauty of the untouched scenery—don’t forget to capture the moment on film! Once you reach Thunder Lake, you’ll find it peacefully surrounded by ridges and grassy meadows. To the South you’ll find Tanima Peak, and to the Northwest are Pilot Mountain and Mount Alice. Set aside plenty of time to explore the area and its surrounding ponds and knolls. You can also find important and useful information posted at the Ranger Patrol Cabin on the lake’s northeast shore. Don’t miss out on the incredible opportunity to capture nature at its best! Calypso Cascades offers stunning waterfalls that drop from a steep granite cliff. The swift waters run from Cony Creek and provide beauty to share with the whole family. Beware that the 3.6-mile roundtrip trail to Calypso Cascades is easy to moderate in difficulty, but it can provide a few hours of kid-friendly fun. Watch for wildlife along the way—moose have been spotted standing in the greenery! 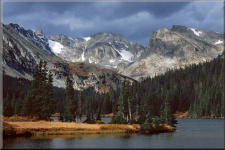 Check out http://www.colorado-hiking-vacations.com/rocky-mountain-national-park-trails.html for more information. A popular destination for families and day hikers, Ouzel Falls offers a 2.7-mile hike one way. As a challenge during the journey, encourage children to spot the ouzel (also known as a “dipper”)—a species of bird that dives into streams and “flies” underwater in search for its prey at the bottom. Half a mile from the beginning of the trail is Copeland Falls, which consists of two falls, one being downstream from the other. Almost one mile farther is a bridge that crosses the North St. Vrain Creek, offering more falls-sightings while crossing. Following the bridge is Calypso Cascades, the most film-worthy destination in the park. Beyond Calypso Cascades are the remains of the lightning-induced 1978 Ouzel Lake fire. As you make the final ascension to Ouzel Falls, you will begin to hear sounds of the powerful, rushing waters. If you haven’t already spotted any ouzel along the way, get ready to be entertained by these amusing birds. If hiking is not your forte, consider exploring Rocky Mountain National Park and nearby Roosevelt National Forest by horseback. Allenspark Livery offers a several different guides trail rides, ranging in length from one hour “Meadow Rides” to all day excursions. You can also hire the horses for a guided fishing trip or a Western-style overnight camp out. For more information about Allenspark Livery, visit http://www.sombrero.com/custompages/allenspark_sche.asp. Trail Ridge Road is the highest continuous paved highway in North America, and it offers breathtaking views of the Continental Divide and the rest of Rocky Mountain National Park. The highlight for us is the part of the highway that rises above the tree line and courses through 11 miles of alpine tundra. The artic-like terrain is home to uniquely adapted flora and fauna. Trail Ridge Road is typically open from late-May through mid-October, depending on the weather. The Alpine Visitor Center at the crest of the road has a variety of exhibits and programs. Visit http://www.coloradodot.info/travel/scenic-byways/north-central/trail-ridge-rd for more information. The Peak-to-Peak Highway is another lovely drive and Colorado’s oldest scenic byway. It begins closer to Aspen Mountain Cabin than Trail Ridge Road, and passes a number of breathtaking landmarks, including Lily Mountain and the Twin Sisters. Check out http://www.coloradodot.info/travel/scenic-byways/north-central/peak-to-peak for more information.